In the month since the Army of Occupation under Zachary Taylor had arrived at the Rio Grande, they had started construction of a series of forts, and stared warily across the river at Mexican forces in Matamoros. The tension continued to build, and nearly came to a boiling point with the murder of Col. Truman Cross, an American officer. Nearly every morning, Cross “was in the habit of riding out every morning for the purpose of exercise,” but on April 10, he failed to return. Search parties failed to find Cross until nearly two weeks later, when American soldiers discovered Truman’s corpse “stripped, and the flesh torn from it by vultures.” Furious, Taylor sent a demand for explanations across the river, but the Mexican commander in Matamoros insisted his men had nothing to do with Cross’ death—it must have been guerillas, bandits not part of the regular Mexican Army. With no concrete proof, Taylor had no choice but to withdraw his accusations. Searching for Cross led to more American casualties. On April 19 two parties of infantry set out from Taylor’s camp and spread out, trying to cover as much ground as possible. One of those squads of infantry returned unharmed, but the men under the command of Lt. Theodoric Porter, 4th U.S. Infantry, were not so lucky. 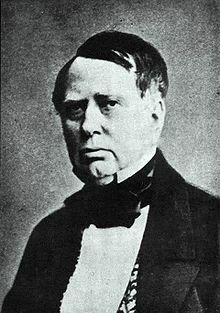 Porter was the younger brother of David Dixon Porter, who would rise to become of the Union’s leading admirals during the Civil War. Lieutenant Porter and his infantry moved out, looking for Cross, when they stumbled upon on a Mexican guerilla, who fired a single shot, and then retreated. Giving chase, Porter’s men captured a small camp of the Mexican irregulars, but were in turn ambushed by a larger force. Porter and one other man were killed, stabbed repeatedly by the guerillas as the rest of the American forces retreated back to Taylor’s camp. Thus, by late April, the tension had soured further; the entire situation compared to a powder keg just waiting for a spark. That spark came on April 25, 1846, 170 years ago. In Matamoros, a new commander had arrived to take over the situation against the American forces across the river. Unlike his predecessor who had watched the Americans, though, Gen. Mariano Arista planned his own offensive. Arista did not intend for Taylor’s force to be allowed to sit unscathed and grow in size, and on April 24, he ordered 1,600 men across the Rio Grande. It did not take long for word to get to Zachary Taylor about the large force now on his side of the river, and the following morning, April 25, Taylor ordered some of his cavalry scouts out to reconnoiter and report back. Captain Seth B. Thornton took about 60 dragoons with him on his reconnaissance, riding out of camp and towards the Mexicans’ reported position. Thornton’s orders were to simply find the Mexican troops and report back—Taylor did not want any more isolated American troops being cut off and killed. Riding with Thornton was his second-in-command, Cpt. 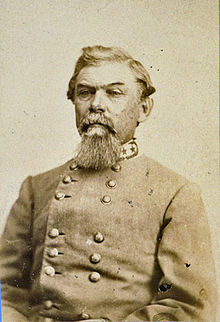 William J. Hardee, who, in the Civil War, would become one of the leading corps commanders in the Confederate Army of Tennessee. Thornton’s contingent of dragoons reached a ranch and entered through the front gate, riding up to the main house to interrogate the inhabitants. In their zeal to find the Mexican troops, the Americans failed to place any guards or pickets at the gate, a decision they would soon regret. While interrogating, Mexican infantry, soon supported by cavalry, arrived at the ranch, “pouring through the narrow entry to the ranch.” Forming battle lines, the Mexican forces soon vastly outnumbered Thornton’s tiny band of dragoons. Rather than surrender his command, Thornton made a rash decision—he ordered his men to charge. The 60 dragoons had absolutely no chance to break through the cordon of steel that opposed them, and as the horses thundered in, the Mexican infantry opened fire. Volleys crackled from the battle lines, spewing musket balls and dirty white smoke across the ranch. In the hail of gunfire, Thornton’s men tried to break off, attempting to outflank the Mexican lines and ride to safety—a move nullified by the Mexican cavalry that closely shadowed them. 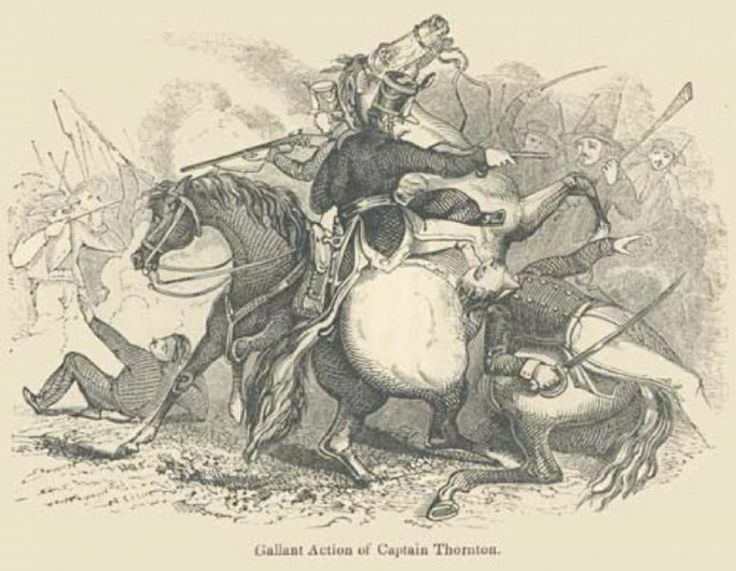 As he looked to and fro, trying to find his way, Thornton’s horse was suddenly shot from beneath him, and the American officer found himself pinned under the beast. Regardless of the treatment of their comrades, American soldiers’ blood boiled and they sought revenge in the wake of the skirmish that soon took the name of The Thornton Affair. Lt. Napoleon Jackson Tecumseh Dana, in the 7th Infantry, scowled in a letter, “The dogs of war are now indeed let loose[. ]” With Mexican forces still on his side of the Rio Grande, it now fell to Zachary Taylor to counter. His response would bring the conflict from odds-and-ends skirmishing to full-fledged battles; the fragile peace between the two nations was in its last days. John Lewis Thomson, History of the War of the United States with Great Britain in 1812, and of the War with Mexico (Philadelphia: J.B. Lippincott Company, 1887), 546. Douglas A. Murphy, Two Armies on the Rio Grande (College Station: Texas A&M University Press, 2015)135. K. Jack Bauer, The Mexican War: 1846-1848 (Lincoln: University of Nebraska Press, 1974), 48. Monterrey is Ours! : The Mexican War Letters of Lieutenant Dana, 1845-1847, Edited by Robert H. Ferrell, University Press of Kentucky, 1990,53. This entry was posted in Armies, Battles and tagged Mariano Arista, Matamoros, Napoleon J.T. Dana, Seth B. Thornton, Thornton Affair, William J. Hardee, Zachary Taylor. Bookmark the permalink.